It is our most popular retaining wall collection. Whether you are building a simple raised garden or tackling a major hillside, the AB Collection will provide just what you need. The AB Collection is easy to install. 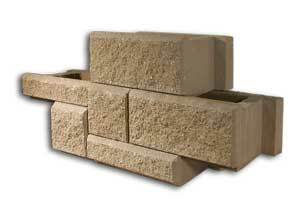 These blocks dry-stack without mortar or footings. The hollow core feature makes them easier to handle and promotes good drainage behind the wall. The raised lip and notch lock each block in place and creates a natural setback. Use one sized block or mix the different block sizes together in the wall to capture the look of hand laid stone. The AB Collection is right at home in residential and commercial settings. AB Classic 6° 1 sq ft. approx. AB Jumbo Junior 6° 0.5 sq ft. approx. AB Lite Stone 6° 0.5 sq ft. approx. Actual dimensions, weights and setbacks will vary by manufacturer. Check with your local Allan Block manufacturer for exact specifications and color availability.